HARTFORD, Conn. (AP) - A Connecticut woman fighting breast cancer got married at a hospital 18 hours before she died. 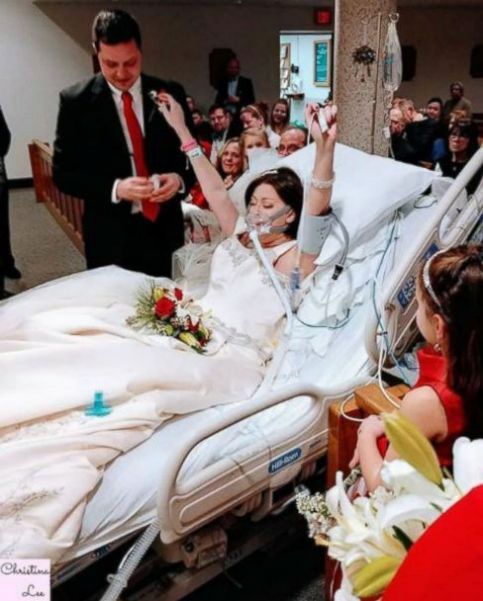 Heather Mosher was dressed in her wedding gown and lying in bed wearing an oxygen mask as she and David Mosher said "I do" Dec. 22 at St. Francis Hospital and Medical Center in Hartford. The 31-year-old died the next day. The East Windsor couple fell in love after meeting at a swing dancing class in 2015. He told news organizations that on the day he planned to propose to her on Dec. 23, 2016, she was diagnosed with cancer. He went through with the proposal. They originally planned to marry Dec. 30, 2017, but doctors urged them to do it sooner. Their planned wedding day ended up being the date of her funeral.